On this Forum, today I noticed that notification button (the bell near the upper right corner) menu is not working properly. Yesterday it worked. Now the menu entries behind the button do not open threads, but only a white page. @manuel The same problem here, i’m using opera. Are you still having this problem? This morning before I left for work, the forum was offline, because of maintenance at the server. It must’ve been a hick-up after the system was rebooted, or something. @Bryanpwo Still the problem persists. That’s odd! I have no difficulties in three browsers, Chromium, Vivaldi and Firefox. Have you tried to empty your cache and cookies? And the emojis are not working. But let’s try that, thanks. LOL, yeah, the emoji’s have disappeared, didn’t see that! So notifications still don’t work for me. If you wiped everything in the preference menu, than that’s the way. I don’t think there is another way. If you’re worried about losing passwords and everything, it will stay, you only have to login on every site, but the auto setting kicks in. But the site isn’t working properly, I’m not redirected when I click on the notification. I even tried to use chromium on Arch, but the same problem. Yes emojis are gone again, i’m pretty sure none of these are related with my pc here. There are some issues after updating the forum to the latest version that I didnt have time to track down yesterday. I’ll take care of them as soon as I can. Thanks for your patience. I am a new user on this forum. My friend tells me this is an awesome forum for information. Sir are you talking about chrome bell button? Hi and welcome on the Antergos forum. yes! it is indeed faster!!! The emojis displayed belong to different emoji sets. 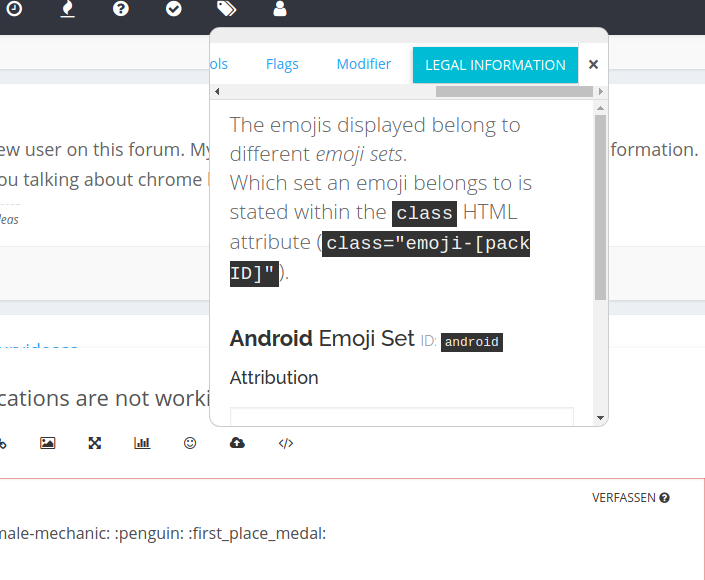 Which set an emoji belongs to is stated within the class HTML attribute (class="emoji-[pack ID]"). Oh wow!!! I didn’t dive into the emoji’s yet and I also like that the emoji’s are categorized now. Like the new email set up as well. what is the main reason its not working correctly? @mypslgate was… Forum Software Update screwed up some stuff.